IMAGE: Madison Keys of the United States reacts against Naomi Osaka of Japan during her third round women's singles match on Day 5 of the 2016 US Open. Photograph: Elsa/Getty Images. 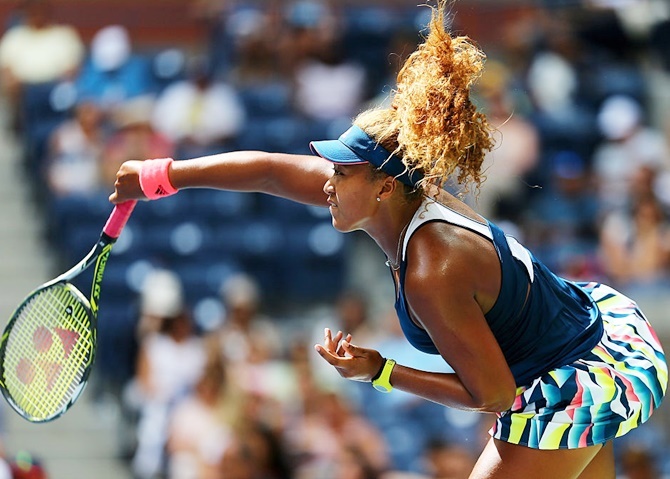 Japanese teenager Naomi Osaka admitted she had ‘freaked out’ as her big lead slipped away against Madison Keys at the US Open on Friday. Osaka was reduced to tears as American eighth seed Keys claimed a dramatic 7-5, 4-6, 7-6(3) comeback win to reach the fourth round. Leading 5-1 in the third set and on the cusp of the biggest victory of her career, Osaka crumbled as Keys swept the next five games en route to a victory that stunned her 18-year-old opponent. "Those aren't the most fun matches but I just knew that if I stayed in the match that I could maybe have a chance to come back and get back in it," said Keys, who will next meet former World No 1 and US Open finalist Caroline Wozniacki. IMAGE: Naomi Osaka of Japan reacts. Photograph: Elsa/Getty Images. "Once I was able to get a little bit of momentum, I felt like I found my game a bit more. At that point, I knew I had to kind of step up or else I was going to be going home." The excruciating collapse by Osaka played out on one of the game's biggest stages. 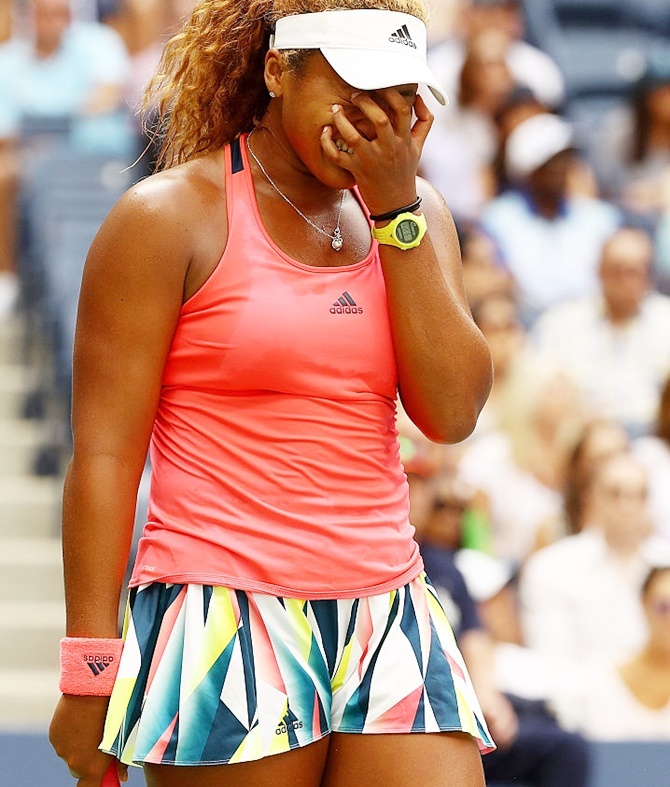 The Japanese world number 81 was in tears several times, a distraught Osaka at one point hanging her head and covering her eyes as she walked to a corner of the court. But there was no place to hide inside the massive Arthur Ashe Stadium from the gaze of thousands of fans or a ruthless Keys, who moved in for the kill and clinched the comeback when Osaka sent a return wide. Osaka's meltdown was in many ways reminiscent of a distraught Martina Hingis collapse to Steffi Graf on centre court at Roland Garros in 1999 and Jana Novotna's tearful loss to Graf in the 1993 Wimbledon final when the Czech sobbed on the shoulder of the Duchess of Kent. IMAGE: Madison Keys of the United States returns a shot to Naomi Osaka of Japan. Photograph: Elsa/Getty Images. "At the end of the match, it kind of came down to experience, being in that situation before, having lost some tough matches," said Keys. "It happens. It just makes you stronger. "You kind of just put it in the back of your mind and use it to fuel yourself and get back out there and try to get better." It was not the first great escape by Keys in this US Open fortnight. The 21-year-old American has made an adventurous start to the year's final grand slam, rallying from a set and a break down in her opening match to see off American Alison Riske in a three-set nailbiter. Keys was again forced to go the distance and a bit more by Osaka, in her first appearance in the US Open main draw. Osaka came out swinging freely from the baseline like a player with nothing lose but when the teenager suddenly looked up at the scoreboard with a 5-1 lead in the third set, the weight of reality dropped upon her. IMAGE: Naomi Osaka of Japan serves to Madison Keys of the United States. Photograph: Elsa/Getty Images. With each missed shot, each missed opportunity, her nerves frayed a little more. Osaka twice served for the match and twice was broken. "At 5-1 I was just very nervous," admitted Osaka. "I kind of wanted to close it out. "I felt like I could rely on my serve at that point because I think she was serving at 5-1. It didn't really bother me that she held serve at that time. "But it really started freaking me out when she was going 5-2, 5-3, 5-4 those times."